Witzieshoek in the 1950s was a small reserve of some 40 000 hectares. Located in the north-eastern part of the Orange Free State, adjacent to the northern border of Lesotho, it was a tiny fragment of what was once Sotho territory annexed by the Boers in the 1860s. The reserve was ‘granted’ to the great-grandfather of Paulus Howell Mopeli, a key actor in the Witzieshoek rebellion of 1950-51, by President Brandt in a peace treaty in 1867. In 1875 the Batlhokwa community entered Witzieshoek, and since that time it was occupied by the Bakwena and Batlhokwa communities. In the 1940s, Witzieshoek ‘was regarded as a very important water catchment area.’ Agricultural officers became concerned that because of ‘over-grazing on the steep slopes and tilling of lands in the spongy catchment areas’ the ‘water flow in the six major streams had diminished by half and that the whole area’s water catchment capacity was rapidly deteriorating, affecting conditions in the Orange Free State and southern Transvaal.’ Overcrowding and the pressure on land became acute, and by the mid-1940s half of the residents possessed no agricultural land. While Witzieshoek covered an estimated 40 000 hectares, only 4 000 hectares were considered cultivatable, the rest being suitable for grazing or as mountainside and barren land. Increasing numbers of people became migrant workers on the mines and in the factories of distant towns and cities. By 1950 the population of Witzieshoek stood at some 14 000 and the incidence of migrant labour was extensive and the system well-established. In 1939, Betterment Areas Proclamation No. 31 was applied to Witzieshoek. At meetings with community members ‘plans for the making of contour and diversion banks, fencing of grazing camps, provision of bulls and culling of stock were explained. Thereafter, numerous measures were indeed implemented – contour and diversion banks and dams were constructed, grazing camps and eroded areas were fenced, and plantations of gum, pine and poplar trees were established. These seem to have been generally accepted by the Reserve Board, including the traditional leaders and the community, and there was minimal opposition. The precipitating factor of the rebellion, however, was the state’s decision to impose limitations on the number of stock and the cattle-culling measures of the 1940s. In 1940, the stock carrying capacity for Witzieshoek was established to be 12 500 ‘cattle units’ (that is, one cow or five small stock). An agreement was concluded whereby inferior cattle would be culled because of overstocking. This happened in 1942, although ‘on this occasion Eva Mota, the Regent of the Batlhokwa”¦refused to have her stock culled and was prosecuted and fined. A further stock count in 1946 found there were over 13 700 cattle units. This time, however, the state’s attempt to enforce culling met with vigorous opposition. In 1946 Paulus Howell Mopeli (Mopelinyana) and three other stock owners ‘refused to submit their cattle to culling. They were charged and convicted but on appeal to the Supreme Court, the judgment was set aside....This legal victory boosted the morale of the protesters,’ and ‘many proceeded to ignore culling orders. The state’s attempt to carry out a second cattle culling met with resistance because as far as cattle owners were concerned they had only conceded to the culling of inferior cattle, and not to culling as a means of limiting stock. This position was made clear by a statement at a meeting of the Reserve Board in January 1947: ‘In 1942 it was announced that only inferior cattle would be culled. Now stock is being culled in order to reduce it. The tribe has been deceived. It did not accept the limitation of stock.’ Sometimes oxen, indispensable for farming were culled. In the view of Atwell Mopeli, ‘the rich suffer little, those with their hundred lost three, as did those with five or ten. Also provoking resentment was the ban on felling of trees which had been planted by the people. A strong sense of grievance, then, existed that traditional practices were being tampered with. There was passive resistance, active non-cooperation and acts of sabotage on the part of sections of the community. Three plantations were partially burnt between July and September 1949, and over three kilometres of fencing destroyed in November. By the close ‘of 1949 it was clear that culling was a complete failure as a result of active and passive resistance.’ The community refused to heed the NAD’s instructions, and undermined an attempt to count stock by refusing to present their stock. An attempt to cull stock in February 1950 failed in the face of an extensive campaign of resistance. Stock brought for culling were driven off by militants mounted on horses and, on 13 February 1950, 300 horsemen presented a letter to the NC threatening bloodshed if police and state officials interfered with the community’s stock. Despite this warning, another culling was set for 16 February 1950. This once again met with active resistance, and the following day a gathering of 400 armed people assembled outside the office of the NAD to repeat the earlier warning of bloodshed if the state persisted in its attempts to cull stock. The following month another letter was delivered to the NC by 300 armed men. In October 1950, a Commission of Enquiry into the events in Witzieshoek was finally appointed. Arrangements were made for four members of the Sechaba to testify before the Commission. On the appointed day some 1 300 people gathered outside the court. During the course of the proceedings two objections arose: to the composition of the Commission of Enquiry and to the hearings being conducted in the courthouse as it meant that the vast majority of the people could not attend. It was suggested that the hearings be conducted in open air; consequently, the Enquiry was postponed to 27 November 1950. However, on 22 November Proclamation 28 of 1950 was issued prohibiting meetings of more than three people. Police reinforcements were sent into Witzieshoek to come under the overall command of a Major I.P.S. Terblanche, who threatened that he would sweep Witzieshoek with fire if there was continued resistance. On 27 November, the day the Commission was due to sit again, a large crowd assembled at Mopelinyana’s homestead in Namoha village to discuss tactics, many people unaware that the meeting was ‘illegal’ until after they has already gathered. The witnesses who were to give evidence left at midday with the lawyers. That afternoon Major Terblanche and 38 armed mounted police arrived to ‘subpoena four persons, including Mopelinyana, to testify before the commission of inquiry.’ He pronounced the meeting illegal, and demanded that the gathering of some 600 disperse. There are differing accounts of what happened next. One account is that ‘a pistol shot was fired from the crowd,’ that ‘the women started the molilietsane (“war cry”), and that the police were attacked from all sides with weapons which were produced from beneath blankets. Two policemen and 14 Blacks were killed. The Witzieshoek rebellion of 1950-51 was essentially ‘a response to the increasing pressure on the arable land of the Reserve, caused by such government action as the 1913 Land Act.’ There was increasing over-population and, concomitantly, economic decline and social deprivation. Inequalities were as also highly visible: ‘the wealth of a number of white traders in the territory contrasted sharply with the poverty of the inhabitants – the more so because they were allowed to keep stock, grazing land and agricultural plots. Rather than address the key issue of land shortage, betterment ‘finally destroyed the hope many landless people, people with small patches of land, and people without any land and stock, ever had of one day obtaining these traditional symbols of status and wealth. The killings were followed by widespread arrests, and on 2 December 1950 Verwoerd signed a proclamation enabling the detention without trial of fourteen ‘ringleaders.’ After a four month long preparatory examination of some 130 people, 104 were committed for trial for public violence. The trial lasted almost a year: ‘25 of the original accused had by then been discharged and 6 of the remaining 79 were sentenced to one year imprisonment for holding an unauthorised meeting. 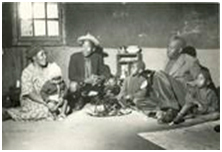 The rest were found guilty of public violence and sentenced to terms of imprisonment ranging from 18 months to 5 years, leave to appeal being refused.’ Eight people were banished from Witzieshoek between 1951 and 1954 as a consequence of their participation in the uprising: Paulus Howell Mopeli; Treaty Mahlouoe Mopeli, Piet Mokoena, Caswell Moloi, Matela Mantsoe, Jim Lithako, Mothebang Mopeli and Maretile Kooae. Mopelinyana first served a prison sentence in Johannesburg and was then banished in 1952 to the Middelburg district of the Transvaal. Thereafter, he was banished to Bothaspruit Farm in the District of Groblersdal in the Transvaal. In March 1954 he was transferred to the Native Trust Farm Uitkyk No. 92 in Groblersdal District. It was reported that Mopelinyana was not restricted to the farm and it was alleged that he used his freedom of movement to garner support for his ‘anti-state cause’ and that ‘left-leaning’ people come at night to the home he shared with his partner Treaty Mopeli. As a result the couple were transferred to the banishment camp at Frenchdale in the Mafeking district. Mopelinyana refused to accept any state allowance arguing that this would be tantamount to ‘compromising with the enemy,’ and he suffered great hardship. In 1965, the couple was again transferred to another site of banishment - Ewbank Farm in the Kuruman District of the Northern Cape. It was reported that Frenchdale was now needed for ‘Bantus’ that were to be moved from the ‘swartkolle’ Doornbult and Vergenoeg in the Mafeking District, and the six inhabitants of Frenchdale had to therefore be moved. Treaty Mahlouoe Mopeli was banished in 1954 to Uitkyk Farm No. 92 in the Groblersdal district of the Transvaal, where she joined her partner Chief Paulus Howell Mopeli. It was noted that despite the banishment of her partner and other leaders from Witzieshoek, there continued to be opposition to state interventions. One of the key ‘agitators,’ indeed, a leader of the ‘agitators’ was Treaty Mahlouoe Mopeli. The fact that she had refused the NAD’s ‘generous’ offer to join her banished partner was construed as her wishing to be in Witzieshoek to continue resistance in Chief Mopeli’s name. Together with Chief Mopeli she was banished to Frenchdale in 1957. Thereafter, she was banished to Ewbank Farm in the Kuruman District. Her banishment order was only withdrawn in July 1972. Caswell Moloi is described as a leader of the recalcitrant ‘Natives’ in the Witzieshoek Native Reserve. He was banished to Frenchdale in 1952, and on release from banishment in 1959 lived in Harrismith. His banishment order was revoked in 1962. Matela Mantsoe was a ‘recalcitrant native’ who served a two-year jail sentence in Bloemfontein. He was banished to Frenchdale banishment camp in the Northern Cape in 1952. He was released from banishment in 1959 and his banishment order was revoked in 1962. Piet Mokoena, a strong supporter of Paulus Howell Mopeli, was alleged to be undermining the authority of the appointed chief. He was banished in 1954 to Frenchdale Trust Farm. His banishment followed ‘the announced visit by the police, the call to the Commissioner’s office, and the imposition of the banishment order.’ Joseph met him in 1962 at Frenchdale, where he had been in banishment for eight years. Mokoena had indicated that ‘the banished men who were already there when he arrived had long since been allowed to return to their various homes. But he remained, and other men had followed.’ On being banished he had been given £2, but nothing else thereafter. Jim Lithako was also banished in 1954, to ‘Zwelitsha Native Reserve’ near King Williamstown; he was said to be one of the leading ‘agitator’s in Witzieshoek, who had also refused the instructions of the head of the Native Commission. In 1957, he was served a new banishment order, because being free to move around in the district of his banishment he was alleged to have paid ‘clandestine visits to Witzieshoek Native Reserve.’ The new order restricted Lithako’s movement to Zwelitsha Township. Lithako’s banishment order was withdrawn on 23 August 1967. Other ‘agitators’ that were banished were Mothebang Mopeli and Maretile Kooae. They were both banished on 8 March 1954, to ‘Native Reserve No. 19’ in the Nkandla district in Natal and Frenchdale respectively. The banishment orders of both men were revoked in August 1967. The gaMatlala and Witzieshoek struggles are interesting cases of rural resistance in the early 1950s to the intrusions of the new apartheid state. In the case of gaMatlala we are fortunate to have a literature that conveys a sense of continuities and discontinuities over a 60 year period of both state-community relations and conflict as well internal schisms and struggles. In terms of the apartheid government’s policy of separate development and the creation of bantustans, Witzieshoek became part of QwaQwa, a bantustan that comprised two entirely geographically separate areas that were essentially grossly overcrowded rural slums. QwaQwa came into being ‘after the creation of a Territorial Authority for Basotho BaBorwa (as QwaQwa then was) in 1969, and was meant to be the ethnic “homeland” for South African South Sotho.